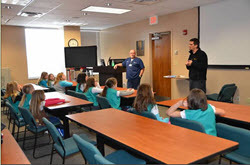 On February 16th, 2015, the South Park Girl Scout Troop 52235 came to WISER for an overview of how to handle emergency situations and how to appropriately administer first aid. 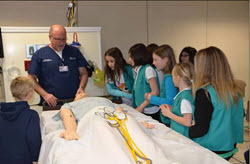 The tour was led by Simulation Specialist Marty Mayer who talked to the girls about his experiences as a paramedic and demonstrated what they should do if they come across someone who is in need of first aid. 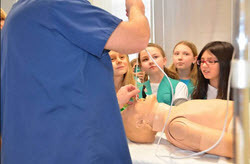 The girls also worked on creating their very own first aid kit that they could keep with them in case they come across a situation where first aid needs to be administered. 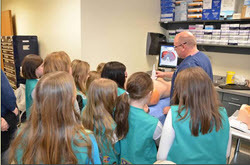 The Troop also observed simulation demonstrations and were shown exactly how medical personnel who come to WISER are trained. The best part of the visit was that the girls earned their first aid badge!